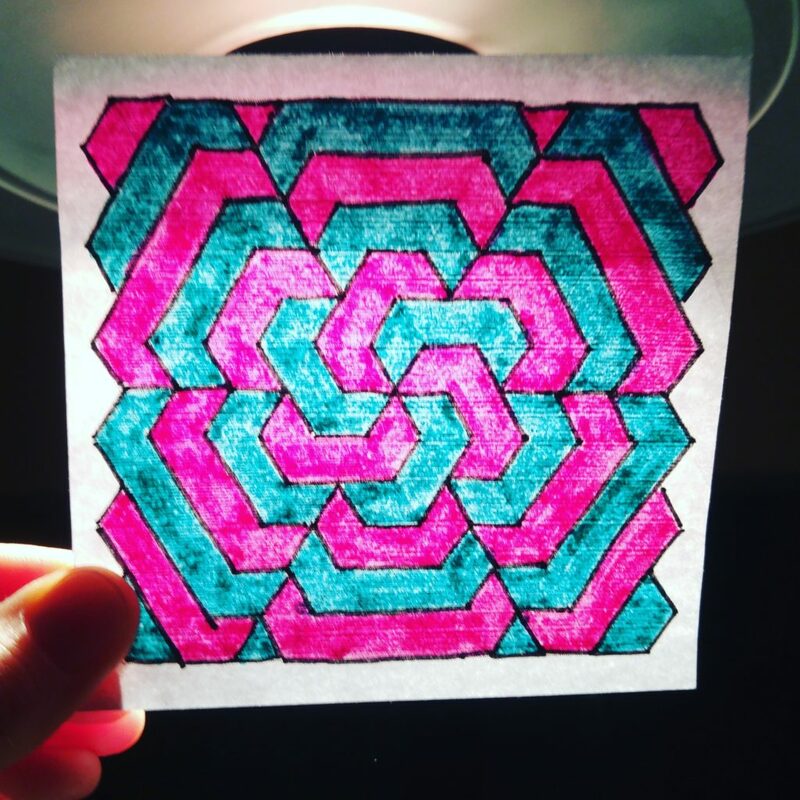 Geomegic | Can’t concentrate? Don’t have time? Here is a tip! 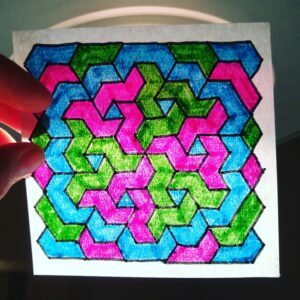 Quick coloring project taking just 10-15 minutes can be a great solution if you can’t concentrate or stay focused for prolonged periods of time. Or maybe you just don’t have a lot of time but still, want to do a finished project. 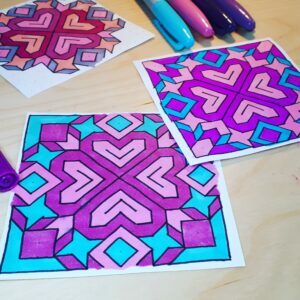 So instead of doing a full-page pattern, you can do a smaller size project. 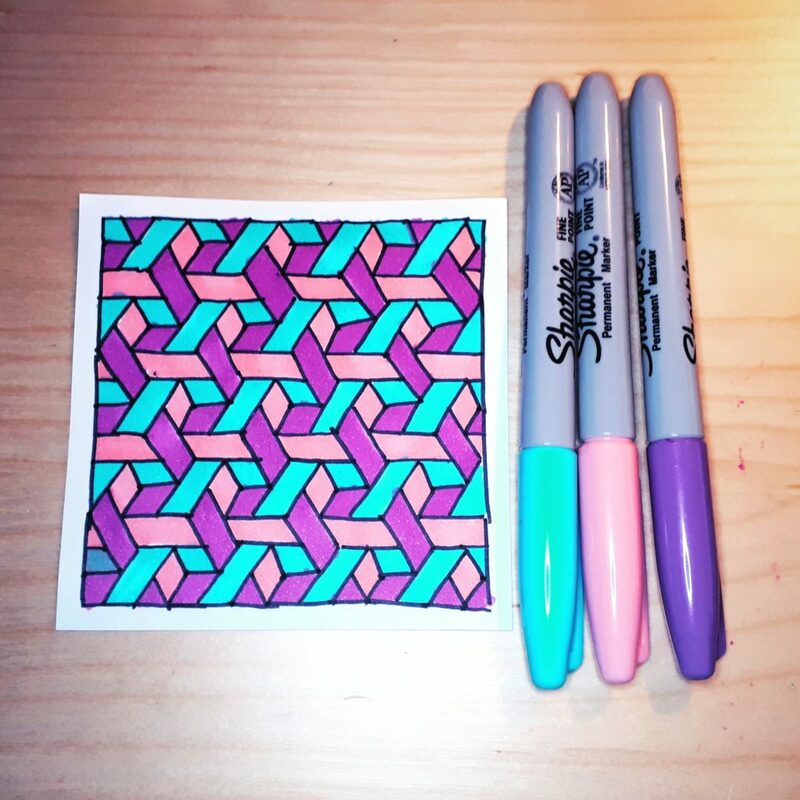 I’ve been really enjoying these coloring “quickies” lately so I thought I’d share it with you. I got this idea sort of by accident. 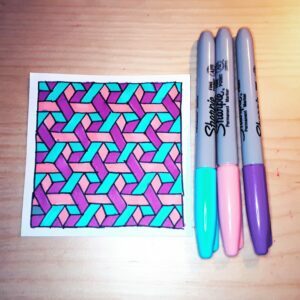 I happened to have a box of white square notes that I use to try out different pattern ideas or color combinations to see if there is anything interesting in them. 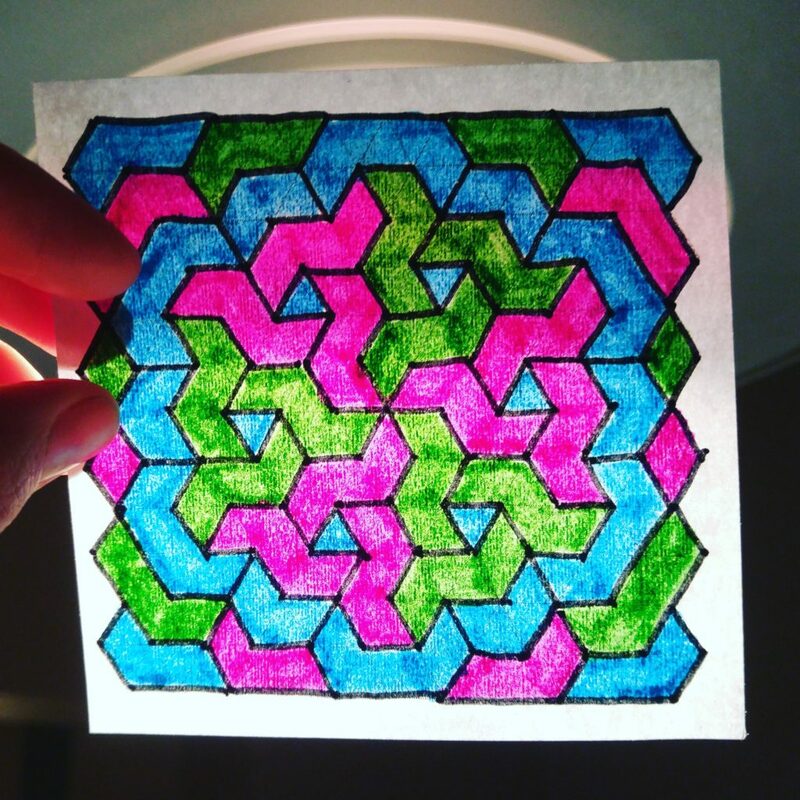 After a while, I realized that I really love these quick projects on their own. 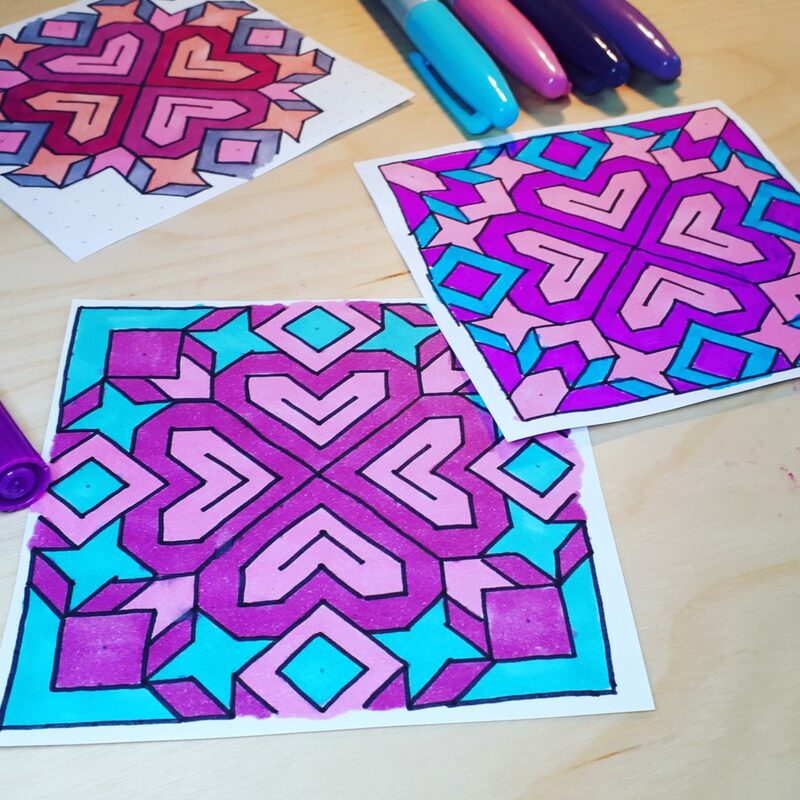 They are quick and fun, do not take a lot of time or require too much effort. I have quite a collection of them right now. To simplify a task for you – chances are you do not have these same small paper notes (I myself fear I will run out of them soon!) 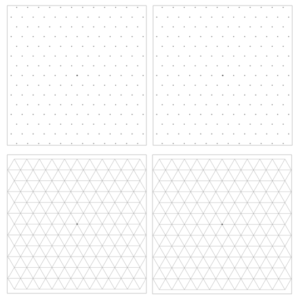 – I’ve created a couple of printable pdf files with various smaller, note-size grids. You can find them together with other grid pages at downloads page and here they are as well. 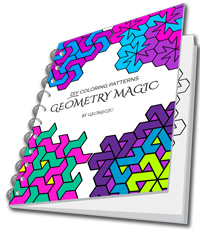 Any patterns on this website can be turned into a quick coloring project. 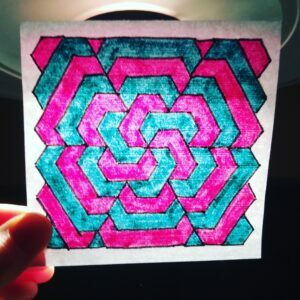 Below is the gallery with various patterns that were created on the smaller size grid page. Ive been recently enjoying this little fun diy projects so I’ve created a printable pdf file for you guys to try this. 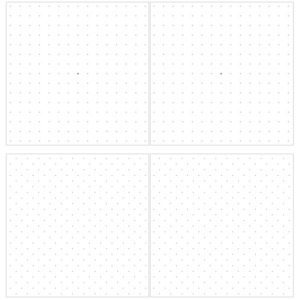 🙋‍♀️🔖 New canvas page with multiple smaller grid notes, triangle grid and triangle dot is available for downloads at https://geomegic.com/downloads/ Enjoy! Upload image (Allowed file types: jpg, gif, png, maximum file size: 256MB.